Ghenadie Popescu has a degree in art with no diploma to show for it. He followed the course at the Academy of Music, Theatre and Fine Arts in Chişinău from start to finish, but never received a degree — because he was never officially admitted. Not having a high school diploma, he couldn’t formally be accepted to the programme or graduate. Nevertheless, he is a practicing contemporary artist in Moldova. In many ways, Popescu’s position is reflective of the situation for artists in post-Soviet Moldova. Throughout the Soviet period and beyond, the Art Academy has remained relatively traditional in its approach, offering classical instruction in painting and sculpture. In 1996, the Soros Centre for Contemporary Art (SCCA) opened in the capital (now K:SAK), providing information and instruction on contemporary art genres and trends, including performance art, installations and conceptual art. Many of the artists now working in those genres emerged from the courses offered by the SCCA; for example, the CarbonART summer camp, where participants could experiment with performance and ephemeral art. 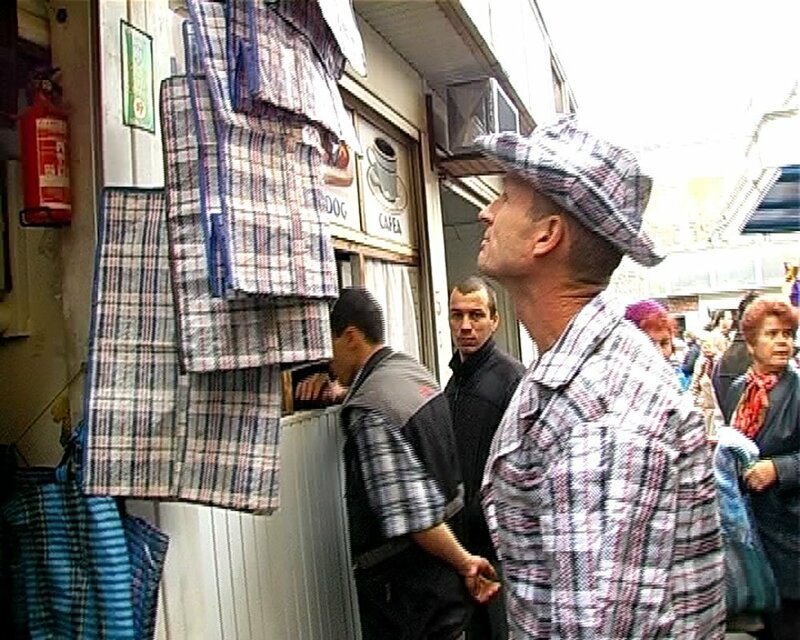 In many ways, this bricolage is typical of contemporary Moldovan art, where the artist acquires material from different sources, be it the SCCA or residencies abroad, and creates his or her own unique flavor of contemporary art, with both local and global resonances. Although Popescu is classically trained, he has forged his own path, developing a singular approach that has both local and universal relevance. At the heart of Popescu’s practice is an interest in local national-cultural identity, and one phenomenon representative of this, for him, is mămăligă. Mămăligă is a traditional dish in Moldova, eastern Romania and western Ukraine. It is similar to polenta, served as porridge or bread. It is a food that bridges national borders, uniting a cultural heritage that spans three countries across EU and Schengen borders. 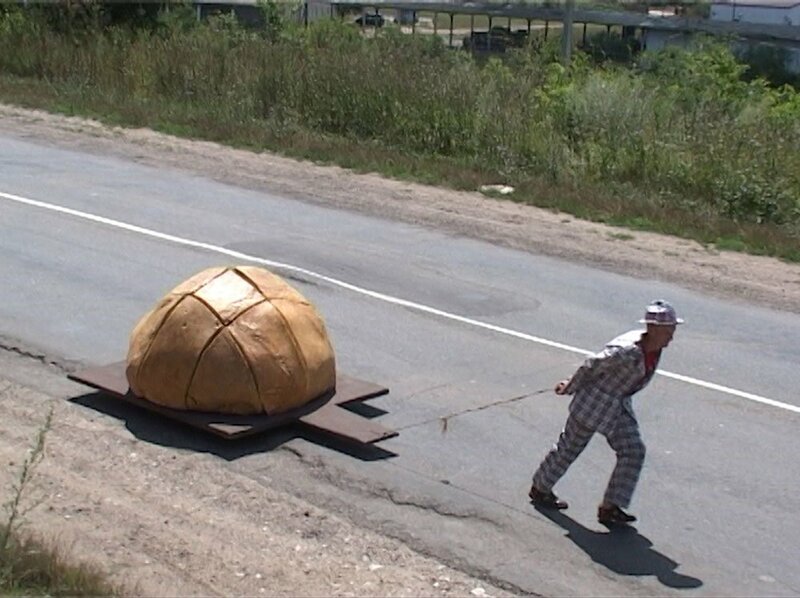 In MM (2006), a long-durational performative piece in which Popescu walked from Chişinău, the capital of Moldova, to Iași, Romania — the capital of the Moldavia region in Romania — the artist pulled behind him a giant mămăligă on wheels. The object, made from cornmeal and glue, was meant as a conversation piece, and indeed it attracted much attention, but just like the shell of a snail, it also functioned as a home for the artist, as it opened up and one person could fit inside. The artist embarked on this journey without any overt political agenda. 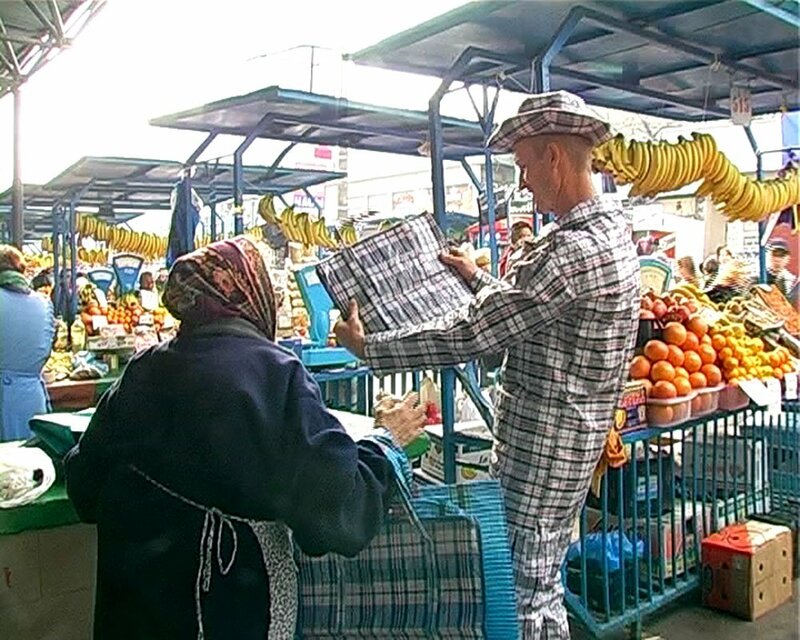 His main aim was to talk to people, and the mămăligă helped to facilitate the conversation by drawing people in out of curiosity. 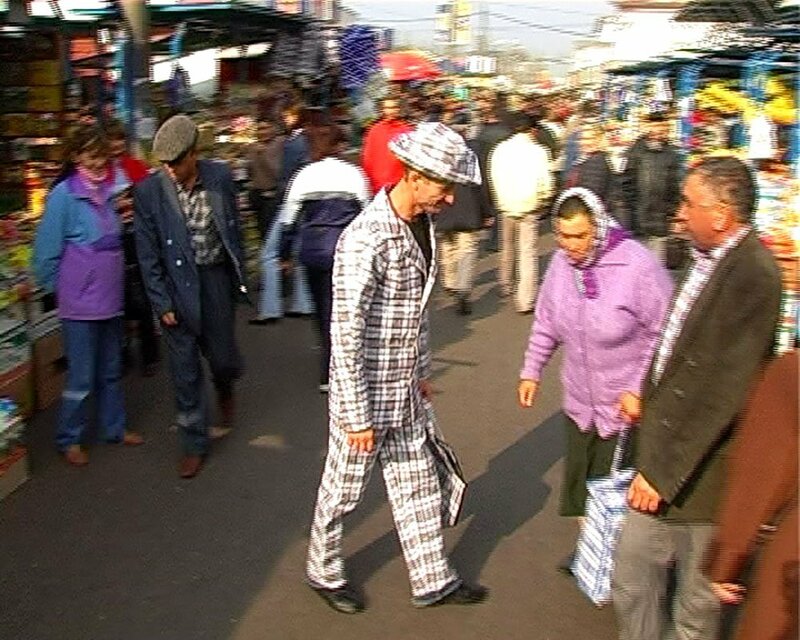 Many of Popescu’s performances involve walking, and in doing so he brings together people and territories with his steps, and through his body. 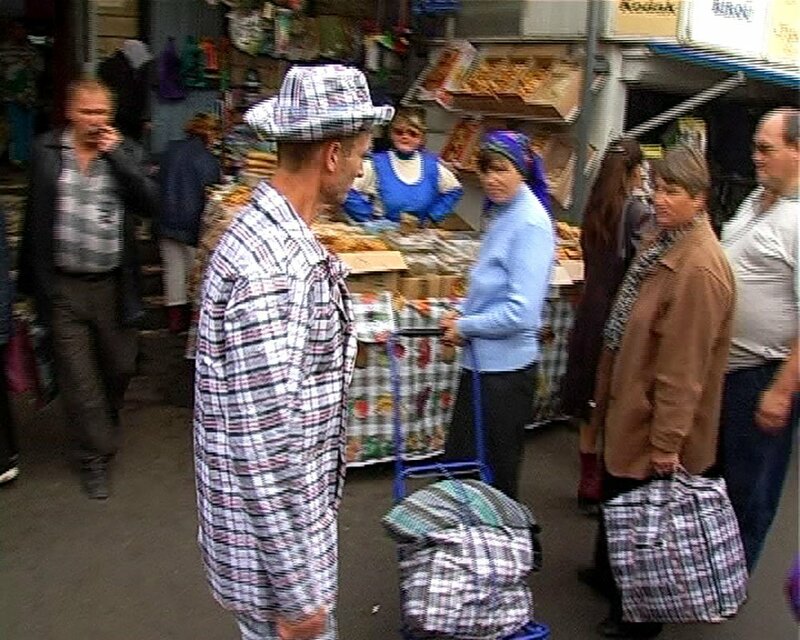 In My I, My II, and My III (2009, 2010, 2011), the artist walked three different lengths of the country of Moldova, pushing not a mămăligă, but a yellow wheelbarrow containing two plastic raffia bags — one red plaid and one blue plaid. Together, they formed a makeshift Moldovan flag. Through these walks, Popescu’s footsteps united a country that is currently divided, and indeed some of these walks took him across the border into Transnistria, the self-proclaimed state in Eastern Moldova and autonomous territorial unit, which even has its own flag. The wheelbarrow in this performance, like in MM, was not included with a deliberate political message, and even though the presence of a makeshift Moldovan flag in Transnistria could have proven controversial, only one person throughout all of his walks recognised the reference. The artist’s My walks produced similar results as MM — he encountered people and spoke to them, and that was effectively the performance; the objects he carried were just a spark for conversation. Popescu’s studio, located behind the National Museum of Ethnography and Natural History, where he works as a conservator, is a museum in and of itself, a collection of peculiarities and objects fashioned by the artist, revealing the playful nature of Popescu’s work. Using a range of found objects, often covered in cornmeal, the artist cobbles together a series of fun and conceptually engaging objects — a bicycle carved out of wood, a yoke made of polenta, with two computer keyboards on it — a comment on what our modern society has done to us — remote control tanks covered with polenta resembling a mămăligă, and a series of comical masks, resembling, for example, Marx and Engels. The artist combines this childlike exploration of materials, national cultural symbols and modern objects with a serious engagement with contemporary issues and his viewers. While he may not have a piece of paper stating that he is an artist, his work reveals a strong engagement with a range of postmodern art approaches, from Pop Art and conceptual art to performance and participation. As one of Europe’s smaller nations, and a former Soviet Republic, Moldova is not often on the radar, not least for contemporary art. But the country boasts a substantial and interesting burgeoning art scene, which warrants attention. 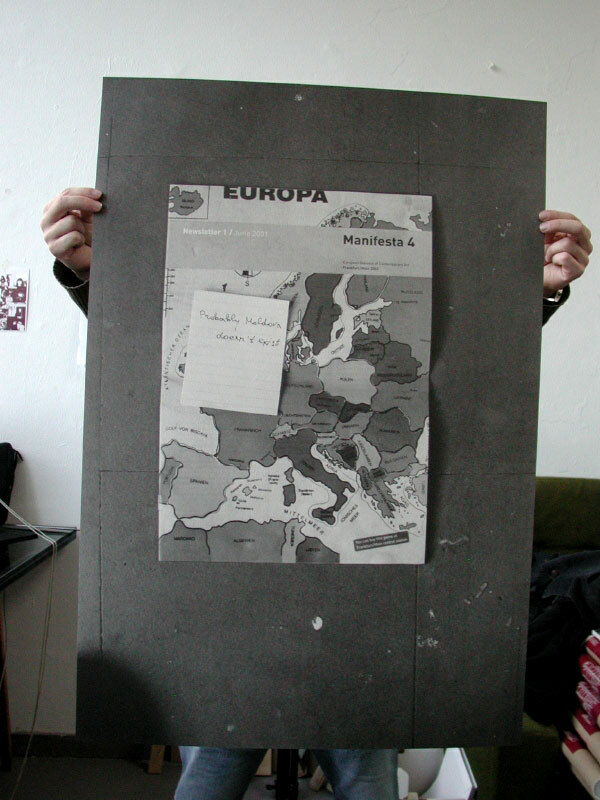 Pavel Braila, a contemporary of Popescu’s, noticed the quite literal absence of Moldova on the cover of Manifesta’s June 2001 Newsletter, which included a map of Europe with the borders of the country not delineated. He responded with a poster, created together with Manuel Raeder, titled Probably Moldova Doesn’t Exist, consisting of the same Manifesta cover with an eponymous note. Like Popescu, Braila associates national cuisine with national cultural identity, and uses it to promote Moldovan culture abroad. The artist has created a food performance, Eurolines Catering, or, Homesick Cuisine, in Berlin, during his DAAD residency in 2006, in which he imports home-cooked food — for example the traditional Moldovan chicken soup, zeama, prepared by his mother, and Moldovan wine — all transported across borders on coaches in raffia bags, which for Braila are a symbol of migration. 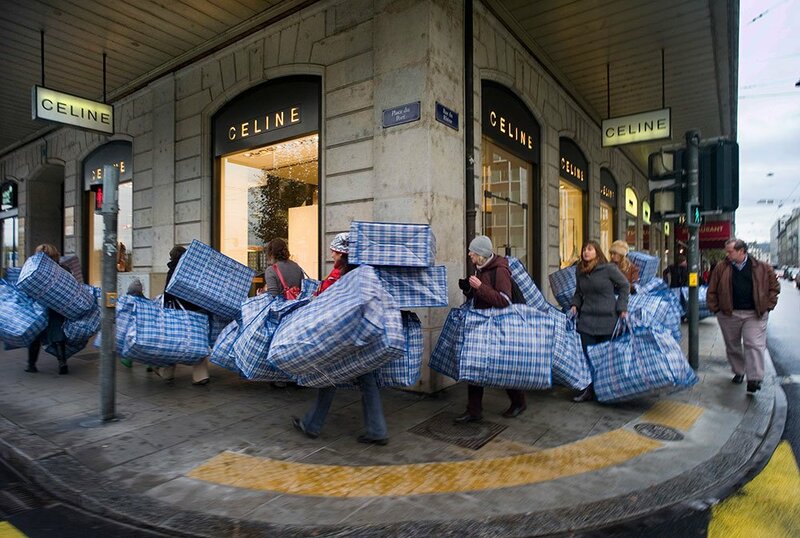 In addition to bridging cultural divides through food, the artist also highlights the informal transportation networks connecting eastern and western Europe, as individuals make use of the buses moving across borders, transporting people as well as things — especially those that could not normally travel by other means, nor as quickly and cheaply, such as fresh bread, or the daily newspaper. Popescu, too, held a food performance on the streets during a residency in Torun, Poland, entitled 5 Beans. He served passersby comfort foods he remembered from the Soviet era: borsch, porridge and kompot, in a nostalgia-infused meal that individuals from many post-communist countries would find familiar, despite the cumbersome difference of language between artist and viewer. 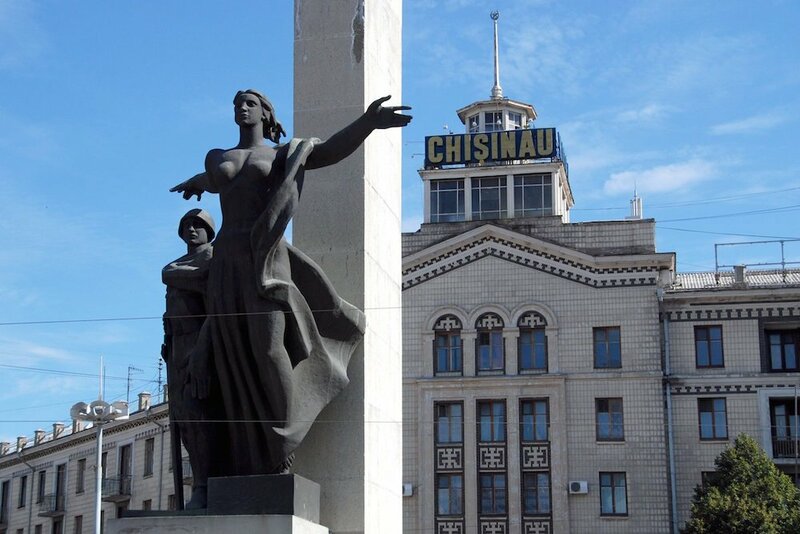 Despite Manifesta’s lack of awareness of the location of the country, it may soon be forced to take notice, as Moldova is currently pursuing EU membership. In Pavel Braila’s performance Welcome to EU, the artist attempted to fast-track this development by painting a circle of twelve gold stars on the front of his Moldova passport, in an effort to make it an EU one (even though EU passports do not have the circle of stars on them). Anyone in the audience who desired the same were invited to have their passports stamped as well. Contemporary art is alive and well in Moldova. It may be hidden from view, omitted from maps, and covered in polenta, but it is well worth a taste.